Healthcare is just too complex. Through the Patient Protection and Affordable Care Act, we all have the right to access healthcare, but for a lot of people it’s still difficult and expensive to do so. Healthcare providers and payers are on a mission to take the “sting” out of healthcare. The goal is to make healthcare more personal, user-friendly and cost effective. That’s a monumental task and requires change in the way many of them do business. It will take some creativity and new approaches to get it done. Of all the activities in healthcare, Barbra, why did we zero in on Population Health and Care Management? Organizations need to help individuals engage and manage their own health – empower them to be healthier. This is the scope of population health and care management. Population health involves understanding who needs what kind of support to live a healthy lifestyle, reaching out and connecting early when there is potential need for medical support. Care management covers the coordination of care for people who are managing chronic conditions, helping them achieve better health, and the authorization of that care from the financing entity. While there used to be a pretty clear distinction between healthcare providers addressing population health and health plans covering financing and care management, these two are overlapping more and more with the focus on the individual as a whole rather than on a single stage. So How can service providers help healthcare organizations get more personal with consumers, members, and patients? Service providers have been providing BPO support for healthcare organizations for years now to operate more efficiently and lower costs. And to do it, they have hired clinical executives and staff, developed industry certification and training programs and technology enabled IP, and established onsite and global centers. We believe they have the capability now to work closely with healthcare organizations of all sizes to help them be successful. Service providers have proven they can partner to help increase adherence to care plans, reduce readmissions, and reduce administrative costs, for example. They work with sets of population data to help design models that identify and drive interventions, and make calls to targeted patients to remind them about appointments and help them figure how to get there, and provide smooth back office operations for utilization management with a combination of skilled clinical and non-clinical resources and automation. How is this Blueprint going to help current and potential services buyers? Performance management and operational analytics: measuring outcomes, analyzing, reporting, and providing insight on metrics for administrative and compliance purposes. It’s a collection of activities that together help healthcare organizations manage outcomes focused on well-being, health, and care – wellness in every day life or specific times like pregnancy, adherence to care plans and medications, emergency room visits, hospital stays, and readmissions, for example. How did the Blueprint analysis turn out? 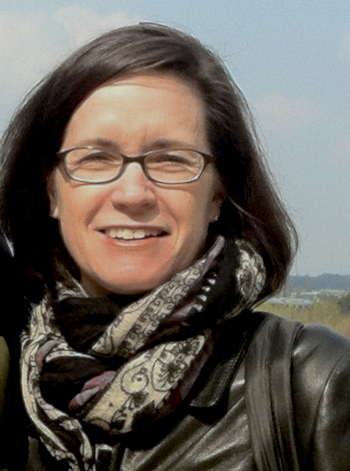 There are 8 service providers who stepped up to the opportunity to share their current capability – skilled resources like clinicians and healthcare data scientists and technology IP and platforms – as well as vision for the future of population health: Accenture, Cognizant, Dell, EXL, HCL, Hinduja Global Services (HGS), Sutherland Global Services, and Wipro. HGS, a quiet, smooth, dedicated operation with unique linkages to hospital for talent, delivering what’s asked. 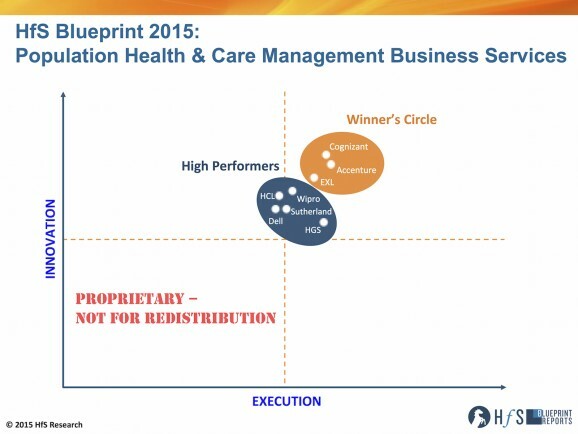 What separates the Winners Circle members from the High Performers is the depth and breadth of experience in healthcare business services within this value chain, clarity of vision for population health and care management in the healthcare industry, and collaboration with clients to date. Each of these service providers has capabilities that can match a business need or challenge of a service buyer. The key is to make the right match. Thanks for your insight, Barbra. So to sum up this Blueprint research, how do you see this market evolving further down the road? For the most part, population health management has been the realm of healthcare providers, while payers drove care management. Healthcare providers in an annual ‘check up’ looked for opportunities to identify and intervene in potential on-set of health issues. Payers identified candidates for care management after an event through claims analysis. But all healthcare organizations, and pharma and medical device companies, need to help in achieving a healthier society. So, activities are overlapping and shifting as healthcare becomes more proactive and individualized. To be successful, services buyers and services providers will need to build tightly knit ecosystems and interoperable networks of technology, process, and people. We will see an increase in hybrid operating models, therefore, that combine internal and external resources. This enables them to get to know and connect with patients in a more individual and friendly fashion, and take the “sting” out of healthcare. HfS readers can click here to view highlights of all our 23 HfS Blueprint reports. I read this paragraph completely concerning the difference of latest and earlier technologies, it's awesome article.